Q: According to reports, Chinese Ambassador to the Maldives recently met with Maldivian President-elect Ibrahim Mohamed Solih. Do you have more details? A: Chinese Ambassador Zhang Lizhong to the Maldives recently called on Maldivian President-elect Ibrahim Mohamed Solih to exchange views on China-Maldives relations. Ambassador Zhang extended the Chinese leadership's congratulations to Mr. Solih on his election and reiterated China's friendly policy towards the Maldives. He also expressed China's readiness to work with the new Maldivian government to consolidate traditional friendship with the Maldives, deepen mutually beneficial cooperation and elevate China-Maldives relations to a new height. President-elect Ibrahim Mohamed Solih asked Ambassador Zhang to convey his cordial greetings and best wishes to Chinese leaders and thanked China for its contributions to the development of his country. He said that the new Maldivian government will remain committed to strengthening its ties with the Chinese government, observing cooperation agreements already signed between the two sides, continuously implementing the existing cooperation projects, and discussing more cooperation projects in such fields as livelihood, infrastructure and tourism to achieve better development of our bilateral relations. Q: At a Senate hearing yesterday, the FBI Director said that China represents the broadest, most complicated, most long-term counter-intelligence threat. What is your comment? A: We've said that China-US relations have undergone several decades of development and our interests are already highly intertwined. To maintain a sound development of our bilateral relations serves the benefits of two countries and two peoples. We hope that the US could give more thoughts to the immediate interests of the two peoples and do more and say more to promote China-US relations and people's well-being, instead of the contrary. Q: On October 10, State Councilor and Foreign Minister Wang Yi talked with Canadian Foreign Minister Chrystia Freeland over the phone at the latter's request. Freeland briefed the Chinese side on the United States-Mexico-Canada Agreement (USMCA), saying that the Canadian side will advance FTA negotiations with other countries based on its own decisions. What's your comment? A: Last night, State Councilor and Foreign Minister Wang Yi had a phone call with Canadian Foreign Minister Chrystia Freeland at the latter's request. Foreign Minister Chrystia Freeland informed the Chinese side of the situation surrounding the USMCA, and made it very clear that the USMCA should not undermine other countries' legitimate interests. The Canadian side will make its own decisions when its comes to FTA negotiations with other countries. China appreciates these remarks. The Chinese side is always committed to upholding free trade and the WTO-centered multilateral trading system and firmly opposes all forms of protectionism and practices of double standards under various pretexts. Under the current circumstances, we hope all regions and free trade arrangements could follow the principle of openness, transparency and inclusiveness, create freer and more convenient environment for global trade, and enhance the benefits of people around the world. Q: The President of Sierra Leone has announced the cancellation of a large-scale airport project planned to be funded by Chinese enterprises, saying that it is uneconomical to undertake such an expensive project. He once accused China's projects in his country of offering no help to the local people or national development. Can you confirm that? What is your comment? Will China consider asking for compensations if such a project does exist? A: According to what I know, this project is just one being discussed between Chinese and Sierra Leone enterprises. You mentioned that the President of Sierra Leone accused China's projects in his country of failing to improve the benefits of local people. I don't know where you got this information. China conducts its cooperation with African countries, including with Sierra Leone, on the basis of equal consultation, mutual benefit and win-win cooperation. The Chinese government always encourages Chinese enterprises to engage in more consultations with local governments and channel more benefits to people's livelihood sectors. This is our consistent policy. We don't believe that this project issue you mentioned shall be exaggerated into the Chinese government and the Sierra Leone government having any problems. Q:The Party which Mr. Solih belongs to took a very critical view of the Chinese projects in the Maldives in the run-up to the elections. Is there any concern in China considering heavy investments made by China in the Maldives? A: The Chinese and Maldivian governments have conducted various forms of cooperation on the basis of equal consultation. Such cooperation aims to promote the economic and social development of the Maldives and their country and people's benefit. We know that now and then there are always some people or forces that cannot bear the sight of China-Maldives cooperation running smoothly. But I have just made the situation very clear. President-elect Solih told Chinese Ambassador Zhang Lizhong explicitly that they very much appreciate China's help and will continue to implement all the deals and cooperation projects they have agreed to with the Chinese side. Q: According to a statement from LOUIS VUITTON, Chinese border officials are cracking down on luxury bags at the border. Is this true? If so, why? A: I am not aware of that. I need to check on it. 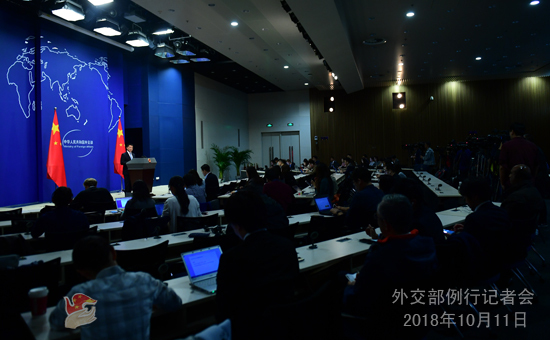 The following question was raised by a journalist after the press conference: the US leaders recently said that China was just "paying lip service" on its reform and opening-up pledge but short on substantive actions. What is your comment? Lu Kang: This groundless accusation by the US side shows no respect for facts. Reform and opening-up is China' s basic policy. This year marks the 40th anniversary of the reform and opening-up policy. Over the past four decades, China has been deepening and expanding its reform and opening-up efforts and achieved historic development goals. The Chinese people have experienced such development firsthand and the international community has borne witness to it as well. China has been unswervingly endeavoring to advance reform and opening-up. Such efforts have been stepped up after the 18th National Congress of the Communist Party of China. From 2013 to 2017, China had rolled out and implemented more than 1500 reform measures. Take opening-up for example. China's average tariff rate has been reduced to 9.8% which will be further reduced to 7.5% on this November 1. This means that China exceeded expectations in fulfilling its commitment undertaken at the WTO accession to reduce tariff rate to 10%, and we managed to make it lower than the average level of developing countries. In the sector of trade in services, the WTO set out 160 sub-sectors that need opening-up. China has opened up 100, nearing the average level of 108 in developed countries and far surpassing the average level of 54 in developing countries. Since the beginning of this year, we have considerably eased the market access for foreign capital in the service sector, in particular in the financial sector. China's pace to advance reform will get faster and our door to the outside world will get wider. It must be pointed out that we will move ahead the reform and opening-up policy while bearing in mind our national conditions, our responsibility to the people, and our own planning. What we will not do is to act according to other country's playbook. 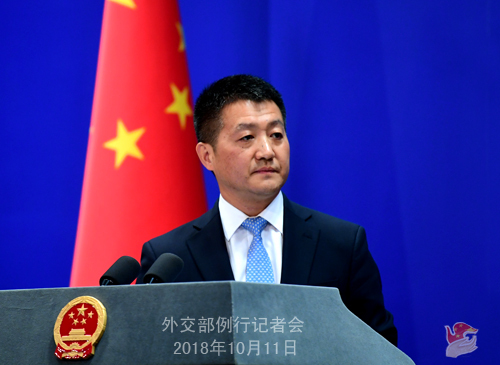 We urge the US to respect facts, take an objective view on the enormous achievements of China's reform and opening-up, and stop making distortive and irresponsible remarks.